I have decided that for the two weeks that we are in Maine I am going to indulge my inner Luddite. I don’t plan to go around smashing any mechanized looms, but I do plan to take those two weeks to revert to a less technological state of being. For years I have harped about wanting to get away from all the mental clutter of our plugged-in lives. Cell phones, the Internet, TV, the 24-hour news cycle, the relentless beat of now, now, now. So I am going to ignore it for a week. I don’t think it will be too hard. The house we are renting doesn’t really have TV and while it has Internet access, I am going to pretend like it doesn’t exist. And I am going to put John under strick orders not to share any news he comes across while he is online. I have a stack of great books that I am taking along which I will blog about before we leave. I was tempted to set up some automatic posts while I am away, but I know if I do that I am going to be too tempted to look online to see if they posted correctly and to see if anyone has commented. So I am going to go cold turkey. Of course this means that I won’t be able to read your blogs for two weeks either. I will certainly miss all of you. But how often does one get to unplug for two weeks? Next Article Time for Game Night! I've managed to be really good this past year. I am never online in the evening although I do check comments from my phone, posting and page updates are no longer done from home. I have much more time to read now. I know you haven't left yet but enjoy your trip! So admirable of you! I couldn't think of doing that, although that probably confirms that I should! 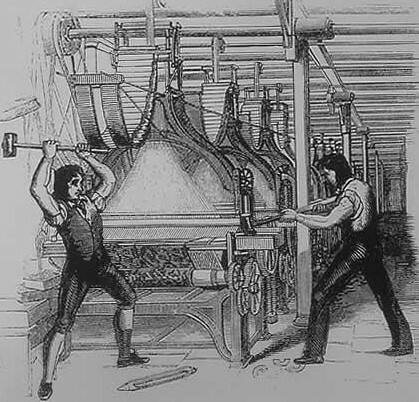 Hope you have a lovely time as a Luddite! You'll be completely renewed Thomas. Not that I'm going to track you down and try to force technology down your throat, but whereabouts in Maine are you going? It is my home state, so I hope you're headed somewhere stunningly beautiful and that there will be good weather for you while you're here! Seriously, it sounds like a great holiday. Being unplugged from the internet is great – I have some relatives I visit during the year who don't have internet, so I go without when I'm with them. It's good to break away. Have a lovely, reading-filled vacation! Cold turkey, huh? Best of luck on that. I remember, a couple of years ago, we were in a cabin in the middle of the Norwegian slopes – no Internet, barely any 3G and just cut away in what seemed to be a slice of paradise. Five days later we returned to civilization and the first thing all of us did was, take out our laptops. Quite depressing when you think about it. After recovering from initial withdrawal symptoms, two unplugged weeks will be heavenly… especially in Maine. Enjoy! Read more, blog less is my motto for the summer. I recently returned from a tiny rental cabin with no electricity. Did not pine away for the internet or email, I must say. At home we cancelled cable and got rid of our tv a few years ago, don't miss that either. Books rule. I SO love the idea of being unplugged for a time, I'd love to do it for monthes and monthes at some point. On your drive up to Maine you should stop at the restaurant I work at in Watch Hill for lunch! It opened in 1917 and is worth the (minor) detour! Indulging your inner Luddite while in Maine sounds lovely. I did a 3-day unplugged weekend several months ago thinking it would be a piece of cake and the first day ended up being kind of hard which scared me a little. After the first day though, it did get easy. Ti: I can do being connected in moderation, but I really want to see what it will be like to totally let go. Rhapsody: I think it helps to be physically away from the normal life as well. Stu: Can I just say that I have never once typed Stu, without accidentally typing “Stud”. Is this subliminal? GITD: I think you are right, but my Google reader will probably have thousands of new posts to look at when I get back. This should compel everyone to write brilliant posts while I am away to see which ones will stand out. Tuulenhaiven: We are going to Islesboro. Susan: So glad you are on the Brookner bandwagon. Christy: Hard to find people without the Internet these days. I am really glad that you gave in to my peer pressure on AB. Can't wait to read your review. ACC: Five days probably isn't enough time to break the habit. I like the idea of being in the middle of the Norwegian slopes. JoAnn: I will have so much to blog about when I get back. Sarah: Our cabin will have electricity so I will be able to see the Scrabble board at night. Daniel: Is Watch Hill in Maine? Stefanie: If I get bored I can just stare at my dog Lucy. She is infinitely interesting. Rhode Island…woops should've been clearer!